What is the one thing that happens when the family gets together? They reminisce the fun times, the good times that are built around some amazing experiences. One way to build such memories is by having a swimming pool installation at home. Swimming pools are a valuable asset that can provide a great family time and a space for relaxation for many years. But there are several things that you need to consider while choosing a pool for your family. We, being the leading swimming pool designers in Toronto who have catered to many families, are here to let you know all about it. Before plunging into the kinds of designs for your home, we would first like you to think about what you should look into and want as a family, in swimming pool designs! What Should You Look for in Swimming Pool Designs? Families are different and thus want different and unique experiences. But before you start making a list of things that you want in your pool or plan on how your swimming pool should be, there are certain things that families should look into. Pool safety is the biggest concern for families who are having a pool installation for the very first time. 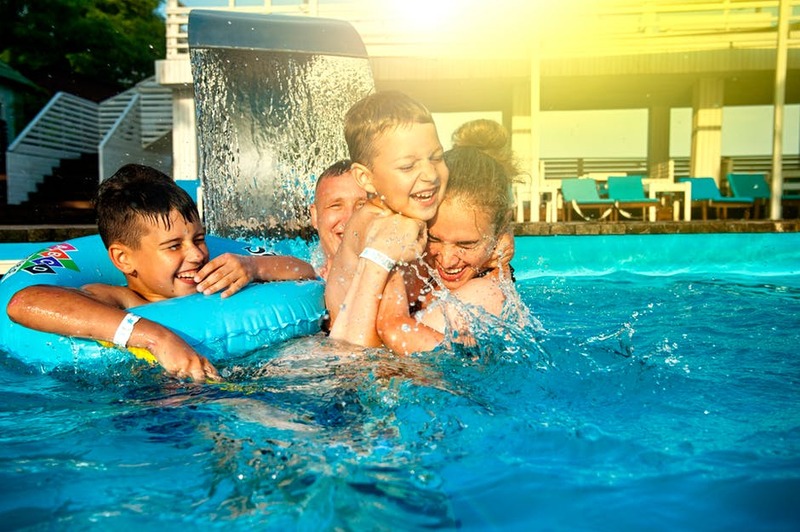 The veterans of swimming pool owners know really well the importance of having a proper safety in your swimming pool, especially when you have children around. Family pools need to have a non-slippery surface. This will help you to reduce the number of accidents caused by slippery surfaces. Always look for swimming pools with safety rails. Children can get tired and would want to hang out in the pool without swimming. The safety rails will help them to catch their breath while learning swimming. Seating areas are beneficial to both, kids and adults. This space allows all the family members to take a break from swimming and sometimes even soak in a little sun. Children have a more sensitive skin that can develop rashes quickly. Thus parents need to be proactive in checking the quality of pool water and try to keep it balanced. A swimming pool in your backyard landscape acts as a centrepiece of a beautiful gallery. It is beautiful to stand alone yet blends very well with the overall composition of your home, thus increasing the appeal of your build. Thus select a swimming pool that matches yours and your home’s persona. Compromise and increase your budget but ever compromise on quality. A quality swimming pool installation can last for years and will require less maintenance. So, what should you check before installing a swimming pool in Toronto? Look for a tough and strong core that can withstand the rough Canadian weather. Get the most water resistant pool as possible. Swimming pools can have water damage as it can seep in the structure and cause problems. The surface of your pool should be resistant to fading. This will help you to have a beautiful looking pool for a long period of time. Family pools can adorn tonnes of useful extra elements that can help you elevate your experience. Such features can help you add real value to your pool lifestyle. There are a range of things that you can consider adding but for starters, you can begin with the heating and lighting system. You can also add a water activity to keep your kids engaged in the pool. Get a Family Friendly Pool for Your Home! If you are looking for a pool that works well for both adults and children then do consider our family-friendly custom swimming pools. Our pools are designed with great efforts to make it suitable for all age groups. Check out some of our amazing family friendly swimming pool designs and pick yours! Call us at 416.504.5263 or drop us a mail on info@landcon.ca to get a free expert consultation. Get in touch today!